Trading With Market Statistics.II The Volume Weighted Average Price (VWAP). In a previous thread, [thread=1962]Part I[/thread] I introduced the Volume Distribution Function in the form of a volume histogram plotted along the price axis (see figure 1 of that thread). 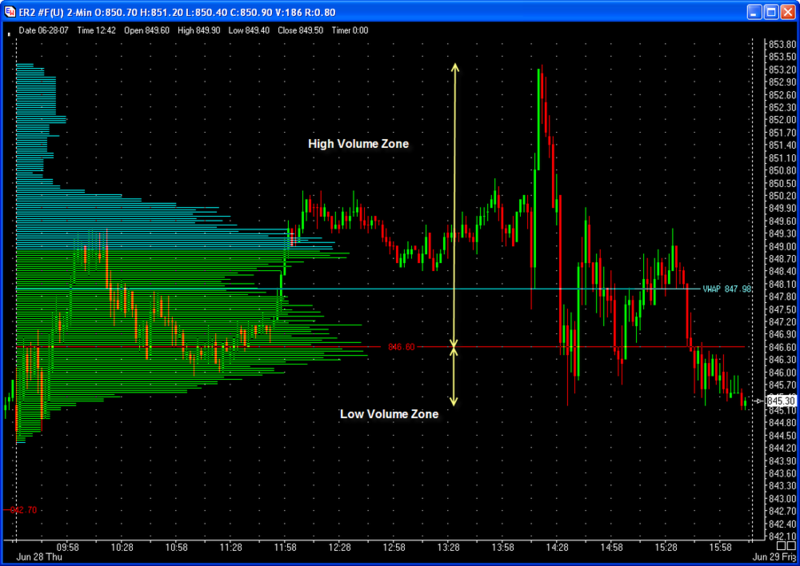 The length of the bars extending out to the right represent the amount of volume traded at that price during the day. The distribution has a peak which I call the peak volume price or PVP ( also known as the Point of Control in Market Profile Analysis, but I won't use that term here in order to avoid any confusion). . The volume distribution is a probability function, thus trading occurs less often in the low volume regions of the distribution compared to the high volume regions. However I also stated that the distribution function is dynamic and that the shape of the distribution changes during the day such that the PVP may change abruptly as the trading day progresses. As such, if price action is in the low volume region, it does not mean that there will be a reversal back to the high volume region. The distribution function could simply expand itself and continue moving in the same direction with an eventual abrupt change in the PVP. This was shown by the price action in figures 2 and 3 of the previous thread. 1) Being the average for the entire distribution, Volume traded above the VWAP is identical to volume traded below the VWAP. In terms of the distribution function as a probability function, it means that when price action is at the VWAP, there is equal probability for price to move up as there is for price to move down. 2) if the VWAP is above the PVP, then more volume has traded above the PVP than below it. The distribution function is thus skewed to the upside and the expectation is that at the PVP, price action should move up. Take a look at the figure below, the ER2 for June 28,2007. 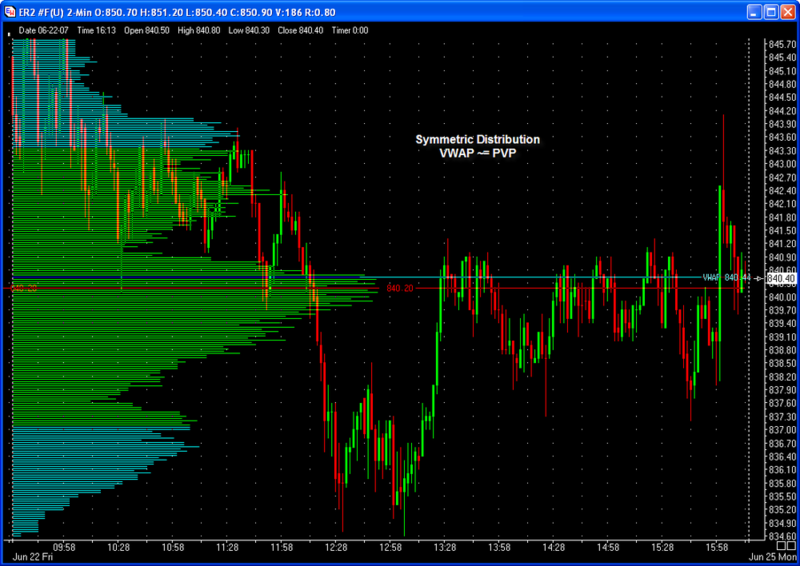 At the end of the day, the VWAP (light blue line) is at 847.98 and the PVP at 846.60. The VWAP > PVP hence more volume was traded above the PVP than below. 3) Conversely, if the VWAP is below the PVP, then more volume has traded below the PVP than above it; the distribution function is skewed to the downside and the expectation is that when price is at the PVP, price action should move down. You see this in the following figure for ES on June 11, 2007. The VWAP is at 1525.32 and the PVP is at 1528.75. VWAP < PVP. Clearly the amount of the skew will be a function of the difference between the VWAP and the PVP. 4) If the VWAP approximately equals the PVP, then the distribution function is symmetric. In this case when price touches the PVP, there is no expectation of price movement in either direction. Instead, expect to see small oscillations about the VWAP. The next image shows this for ER2 on June 22, 2007. VWAP = 840.44 and PVP = 840.20. Oscillations about the VWAP occured for most of the afternoon starting at 13:30.
b)If Price << VWAP, the trend is down. 6) Finally it doesn't matter on what time scale you plot the distribution functions and its associated VWAP. The chart could be a 1, 2 ,3 minute etc time chart, or a tick chart, or a range bar chart or a volume bar chart. The distibution and hence the PVP and VWAP are all the same. You need only take a quick glance at the VWAP and its relation to price, to decide the trend of the market.  In future threads I will present some examples of how to use this information for entering a trade. In [thread=2008]part III[/thread] we will start with the newbies, since they need the most help. After that we will look at more complex situations using only the distribution function and the VWAP. Hi Jerry, as an example of what you are doing, why not do a day by day analysis based on your methods. That way we can also learn the weaknesses and nuances required to understand your approach. Thanks in advance! That's coming next waveslider. I will start with some simple video examples on how to use the distribution function for trading. A quick question: the VWAP constantly moves throughout the current trading day. I see you have the horizontal line, is this line the close of previous day? Torero- the line shown is the VWAP value for the end of the day (blue line). Similarly for the Peak Volume Price (red line). I purposely drew these as horizontal lines so that you could see the relationship between the two. When we start looking at the dynamics of the lines in the upcoming videos, you will see how the lines change with time. I'll ask this now but I guess I might have to wait for the videos to understand this. The way I see it is that you need to really wait for most of the day to finish before you get a clear development of your volume histogram so the VWAP and PVP would be used retrospectively i.e: the VWAP and PVP made today would give me an indication of what to expect tomorrow? In essence this seems to be similar to MP but using volume histograms instead of TPO's. Correct me if I'm wrong though. It's a very interesting thing you've got going on here. Again, very much looking forward to this discussion. Looking back, this is some pretty powerful stuff. Nice area to be aware of for sure. And Nick, I believe you're right. I've been looking at the prior days VWAP and PVP and that seems to work very nicely. Here is my 2cents with the VWAP. I keep a real-time record of the VWAP similar to how a POC moves higher or lower. As the VWAP is lifting I focus on the long side. If I am long and the VWAP starts to drop (even by tenths of a point) I take this as a warning signal. Vice versa for shorts. So picture the VWAP number moving up and down just like the tape. Also keep in mind that the VWAP is a common number viewed by many insitutional traders as well as the general public investors. The way I see it is that you need to really wait for most of the day to finish before you get a clear development of your volume histogram so the VWAP and PVP would be used retrospectively i.e: the VWAP and PVP made today would give me an indication of what to expect tomorrow? Good observation Nick. Todays VWAP and PVP can be used for tomorrow's trade setups. We will cover that topic down the road when we get to more advanced types of trades. However, you will see in the videos that you can use todays developing VWAP to make trades today. This will be the basic VWAP trade that must be understood before we move on. Newbies will be able to get their feet wet here. A sort of crawling before we start walking. Market Profile Analysis is actually a subset of this more general way of looking at market statistics. There are important differences, however. a)Market Profile uses half hour increments for setting up the distribtuion. Generalized market statistics has no special time scale. b)I introduce the concept of the distribution average (the VWAP) which Market Profile does not use. c)There is no concept of value area as used in Market Profile. Value area is a purely heuristic invention. Rather we use the terms, high volume zone or high probability zone and low volume or low probability zone. In addition we will see later on that there is a generalized standard deviation of the VWAP which can be used as a measure of market volatility. But I am getting ahead of myself....so stay tuned. That's good Future.....glad to see you are using VWAP in your trading. Keep in mind that the dynamics of the VWAP is very different from the PVP (What you call the POC). The VWAP changes gradually over time, whereas the PVP changes abruptly. If you follow both the VWAP and PVP at the same time, you will see this dyanmic. I will show some videos of this so you can get the feel for how the market reacts to changes in the relative relation between the two. the POC does not change abruptly. I only say that because you previously stated that PVP and POC are the same concept. I agree that understanding 'value' versus 'current price' is an important trading concept -- and monitoring how price is acting as it attempts to break away from an established 'balance' is another important concept. Ok Dogpile, I will accept your distinction. This is why I will use the term PVP rather than POC in describing the peak in the volume distribution function. This peak does change abruptly with time. The PoC does change abruptly as it is the modal point. So for example if there is a base with a PoC at 432 and price moves up to 478 and builds a new base as more volume is done (or more TPO's pass) at this point the PoC will jump as it becomes higher than the old point. The POC changes every day. Maybe some would consider that abrupt. Sometimes the market builds what appears to be a POC but later it then builds the real POC at a higher or lower level later. Personally, in the timeframes that I watch the market, I do not consider that abrupt. This is a core concept -- if you don't understand this -- you do not understand market profile. 'Price' moves in volatile/abrupt fashion, 'value' takes time to build. POC, by definition, does not move as abruptly as price. If you want to call POC movement 'abrupt' --- then what would you call 'price' movement -- 'super-duper abrupt'....? Dogpile---I suggest you wait to see the videos that I will be posting in the coming weeks. You will then understand what I mean by the discontinuous change that occurs in the PVP compared to the VWAP. Great thread, Jerry, thanks. The first message in it put a lot of light into VWAP usage for me. I watch it for daytrading and until now I just took it as a market sentiment indicator - price above VWAP = bullish and vice versa. But the trick is to figure out (to a certain degree of probability) that the market went too far from VWAP and is about to return. Also I found that the market very often bumps off the VWAP (refuses it), it is a good price level as well. Jerry, we are definitely very interested in the video or further ideas, examples how you use VWAP for trading. I'm struggling to understand what you mean here what you say seems to support the abrupt PoC point of view. As you say the PoC requires time to build (as it is defined as the 'most common' or modal point) When a new area of value has been build (by price staying there for long enough for more TPO's to build than at the old PoC) the PoC then moves abruptly (i.e. jumps) from the old PoC price to the new PoC price. In most instruments price moves up and down tick by tick this is relatively 'smooth'. It is seldom (never for all intents and purposes) that price jumps from the old place of value to the new one. Of course as price moves from one area of value to another it tends to do that fast and volatile but it does at least move through the intermediate price levels. The PoC does not. Once new value has been built it jumps (moves abruptly) to the new level. Actually Jerry's point was to do with VWAP rather than price. The same argument holds. 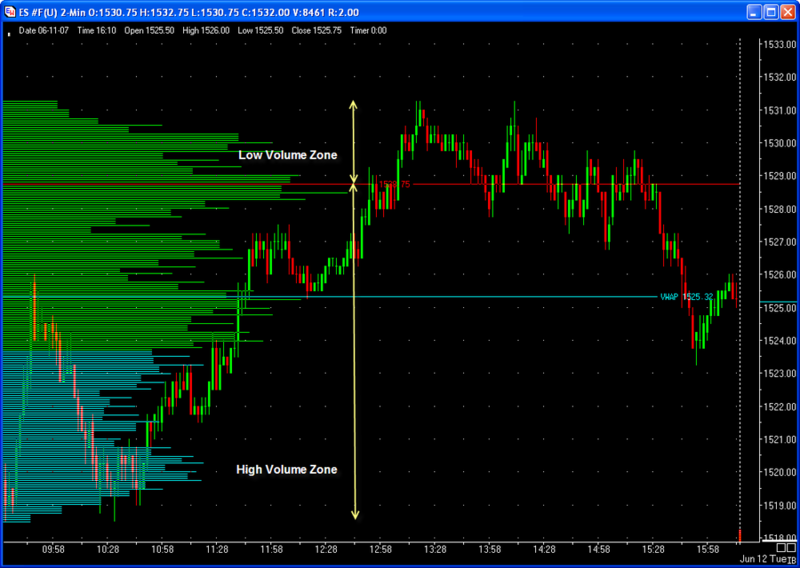 As more and more volume is done in the new area of value the average is slowly drawn to that level. It is the difference between a modal function and average function. The latter can never be as abrupt. Blowfish, I meant its not abrupt in that it takes a good period of time for the POC to build. You are watching it and it is ever so slowly forming until it does. You are right that it basically gaps from the previous days level to the current days level. However, I would hardly call that abrupt. Its not like you expect the market to build the same POC on consecutive days. You know its going to build a different POC so you are fully cognizant of the fact that it is going to gap to the new level. 'Balance' is consistent with a consolidation pattern. When the market is consolidating, it is generally not moving much -- it is just churning -- this is the real-time action that is NOT abrupt. I see from the perspective you took that you can call it 'abrupt' -- I just don't think that is an accurate depiction of how a POC builds -- which is inherently slowly. But you do have a point. POC or PVP is not a continuous function of time even on the same day. You will see this when I show you some videos of the reversal trade. You are correct in the sense that it takes time for a new PVP to develop and replace the old PVP, but as an analytic function of time, it abruptly changes from the old value to the new. This is very much unlike the VWAP, which is a continuous function of time, and changes gradually as price action changes. I suggest you guys wait until I show the videos of this in a future thread, before you continue this discussion. this is part of the POC's appeal, IMO. the market has an interesting habit of touching old POC's. Since VWAP is moving with time, the VWAP does not develop the clean pivot prices like a POC does. I see what you are using PVP for, I personally favor the technical pattern as it relates to a point of 'value' -- whether it be POC or VWAP. PVP is not as interesting to me in this regard. But I am interested in seeing where you are going with this nonetheless -- it might provide another angle upon which to understand some nuances of market behavior. this is part of the POC's appeal, IMO. the market has an interesting habit of touching old POC's. Yes, I agree with you on this. Old POC's or PVP's do get touched. Again you will have to wait until we discuss this in a future thread. NEWBIE isn't ready for that yet. He only knows about today. Since VWAP is moving with time, the VWAP does not develop the clean pivot prices like a POC does. Well it depends on what you mean by clean. VWAP is a pivot point or what I prefer to call a HUP, and it is dynamic, that is it can change with time. Hopefully by the time we get to discussing HUP, we will be able to relegate static pivots to the dust bin. Dogpile, I think you are constantly missing the point here and the difference between modal and average function intra-day. VWAP always changes smoothly during the day, similarly as moving average it is unbroken, continuous function. Like a moving average - it is every day different as well as POC but this is not the point. POC level development can be smooth for a short period of time during the day, but suddenly some completely separated hill can develop on the other side of the day's extreme and POC will jump immediately tens or hundreds of ticks - this always happens in double distribution days and several times during any day. There are several "candidates" for a POC during the day, jumping up and down and it is up to your judgement which you take into account and only one will be POC at the end of the day. But there is just one, always smoothly moving VWAP. This is what everybody here means as 'abrupt' behavior of POC and this is intra-day behavior.